Lexi is 2.5 years old today, she has been potty trained since 22 months. She goes dry at night IF I make sure to put her on the potty before we go to bed and she doesn’t breastfeed much at night. She has been solidly and reliably going on the potty on her own without a reminder since about 24 months. Like any toddler, she waits to pee till the last second because she doesn’t want to stop playing, and then run run runs to the potty, but it’s still amazing to me that she does it all on her own. I wrote about how she got to be potty trained. I can’t say we trained her, because we only introduced her to the concept and kept communicating it to her and then she just went when she was ready. I never wrote about what happened next. She had a few accidents in the car while trying to figure out the whole concept of being out and holding. This quickly stopped after 1-2 trips. On long trips, she would communicate to us when she wanted to go. It was all pretty smooth with no regressions from the beginning. It wasn’t without our involvement, but there was no forcing or prodding, just talking. So that was that, awesomely uneventful, mind-blowingly fast and easy-peasy. Just goes to show you that kids will do what they will do as long as you create the right circumstances when they are ready and no amount of forcing will make it happen until they want it to happen. So I am getting sidetracked…. What I wanted to write about today is underwear. 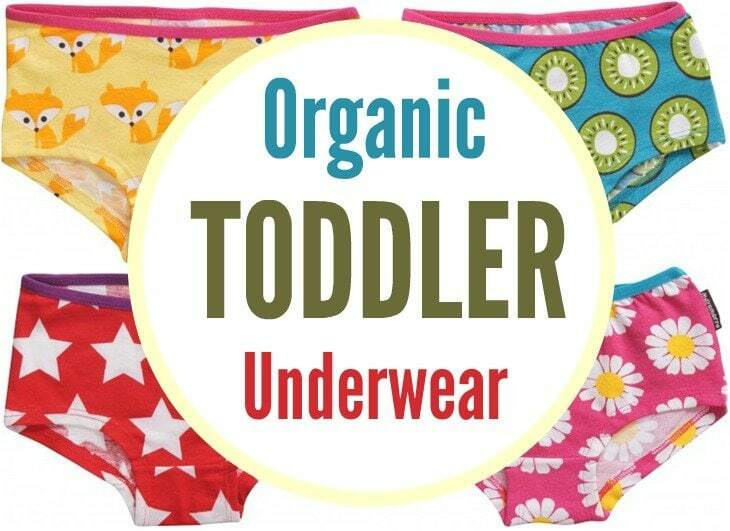 I remember when she just up and started going to the potty we ran out and got undies just to have a few pairs until my online order of PO.P organic undies would come in. They were tiny and scratchy and not all that comfortable. My mom had picked them out at Carter’s store, so I didn’t see if there was anything else there. Once I had a chance to jump online and actually take the time to look for what brands I might want to start with, I discovered that there isn’t a big variety, especially when it comes to organic undies. While we might have phased out full time organic clothing around 6-12 months as planned, one thing we firmly believe in, for as long as we can continue providing it, is organic sleepwear, bedding and, obviously, underwear. Something you have on all day long, near membranes that absorb chemicals really easily. Organic cotton clothing is known to last 5 times longer than clothing made from regular cotton. So, paying a little extra is well worth the durability and time span that the clothing will last compared to non-organic clothing that would be worn out after 15 to 20 washings. From that standpoint, organic undies win out, because you wash them after each change. So I found three brands whose organic undies I adore. Others seemed either too thick or too tall on the waist. These three brands are perfect in their own way. This company adheres to Global Organic Textile Standards (GOTS)-certified cotton. Their sets are just ADORABLE! Not all are organic, but the ones that are have a cute eyelet design. We actually wear the top out with a skirt and it looks so sweet. It’s available in ballerina pink, ivory, and a beautiful shade of blue. The fabric is soooo soft, in fact the softest of all the undies we’ve ever tried. Originally I bought this beautiful set that I love sooo much but then I discovered that it’s not organic. Hopefully Lucky & Me will continue adding organic options to their line up. If you and your kiddo want colors, fun and characters, Maxomorra is perfect for that. Organic underwear doesn’t have to be boring, if you don’t want it to be. All the styles are very cute, full of bright colors with non-commercial characters, which is great because it keeps them unique. I always love grabbing a pair of Maxomorra’s because they make me happy and I know when Lexi gets preferences about what she wears, she will be in love with these. The fit is pretty amazing, too! It rarely wedgies up and hugs her little bum so well. They are honestly the most adorable looking undies I’ve seen. I love the contrast stitching on the girls’ hipsters too – makes them look tomboyish in a way. This line of organic clothing is slightly less costly at $8.75 for a two pack of girl’s organic cotton brief underwear in their ECO collection from Amazon and you can often find it on sale. It comes in fun prints and stripes, which are not limited to girl or boy colors. Polarn has several types of undies, each with a different fit. My favorite fit is this pair: it seems to be softer, slightly thicker and much more stretchy. Lexi is very picky about wedgies, so this seems to fit her pretty well out of all the Polarn undies. I also love that they have the simple white briefs that work really well under white leggings. I hope this helps those of you who have been on the hunt for nice quality organic underwear. Hanna Andersson just released an organic underwear line for boys and girls. All of their organic items are GOTS certified and a huge percentage of non-organic items are Oeko Tex certified! Love the company!